Reese Nielsen remembers playing Brigham City’s old nine-hole course, with par of 37. If that layout existed today, he would know many more details about it. 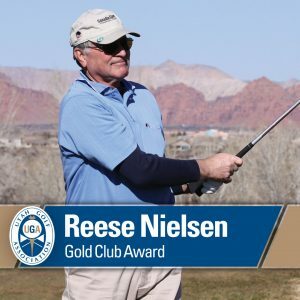 Nielsen directs the Utah Golf Association’s course rating team, charged with thoroughly studying a course to determine its difficulty and applying the numbers to the United States Golf Association’s handicapping system. The process involves a lot of science and a little art, and Nielsen loves it. He has come a long way since the time fellow Thiokol employee Doug Wight asked him to help rate courses. “I had no clue what it was,” he said. Nielsen is thrilled to join the previous 30 winners of the award. The news of his selection “kind of left me speechless,” he said, viewing the award as validation of how important course rating is to the UGA and its members. The process is vital, and Nielsen views his work as evidence that the UGA is designed to support rank-and-file golfers, not only tournament players. “It basically affects everybody in the state that has a handicap index,” he said. If not for the rating system, handicapping would be based only in regard to par, with no consideration for the tees played, the length of the course and other difficulty factors. Think about everything that comes into play, just on one hole: elevation change, psychological obstacles, landing zones for drives, length of approach shots, rough, bunkers and slope of the green. With an engineering background, Nielsen enjoys the analytics involved in course rating. He maintains a rotation of visiting 13 of the 119 ratable courses in Utah each year, making sure the numbers are up to date. New courses are re-evaluated after five years.